House and Senate committees approved four transportation-related measures Tuesday including a modest increase in money for road and bridge repairs and a repeal of a registration surcharge for hybrid vehicles adopted in 2015. The funding bill would divert roughly $16 million over five years to infrastructure by gradually moving part of the Idaho State Police budget from state gas tax revenues and into the state’s general fund. 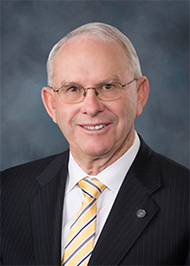 The proposal from sponsor Rep. Joe Palmer, R-Meridian, moved to the House floor on a 10-7 vote of the Transportation committee, which Palmer chairs. Last year Idaho funded the state suicide prevention hotline. This week Idaho legislators heard reports from various groups regarding the progress of this suicide prevention program in our state. One group which is cooperating with Idaho’s suicide prevention efforts if the Veterans Crisis Line. https://www.veteranscrisisline.net/The Veterans Crisis Line connects Veterans in crisis and their families and friends with qualified, caring Department of Veterans Affairs responders through a confidential toll-free hotline, online chat, or text. Veterans and their loved ones can call 1-800-273-8255 and Press 1, chat online, or send a text message to 838255 to receive confidential support 24 hours a day, 7 days a week, 365 days a year. Support for deaf and hard of hearing individuals is available. If the Idaho legislature does not act to improve boat inspections entering Idaho we will have tremendous problems. There is the potential to lose many endangered fish and stop all boating on many of our waterways to stop the spread. This license plate was in Lake Mead for six months so you can see the potential Damage to Idaho’s infrastructure. Senator Patrick visiting with leaders and members of the Murtaugh FFA. The FFA works to make a positive difference in the lives of students by developing their potential for premier leadership, personal growth, and career success through agricultural education. Their motto is: Learning to Do, Doing to Learn, Earning to Live, Living to Serve. 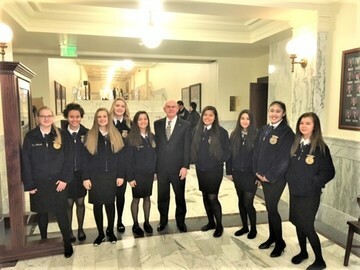 Click Here for more information on the Idaho FFA. 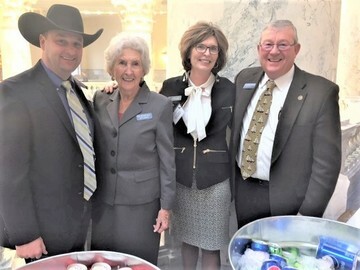 The Idaho Cattle Association (ICA) visited the Capitol rotunda this week. The Idaho Cattle Association (ICA) is the official voice for all segments of the beef industry in Idaho, from seedstock breeders to commercial operators to cattle feeders. 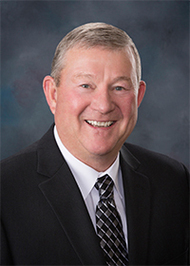 ICA is the grassroots policy development organization for Idaho's second-leading agricultural industry--cattle. Through ICA, cattlemen and women work to create a positive business environment, while providing consumers with a safe and wholesome product. Rep. Bell and Rep. Kauffman meeting with Andy Prescott & Laurie Lickley from the Idaho Cattleman Association. State Budgeting process winding down. The final day of budget hearings ended on Thursday. Now, we can begin the actual budget setting for the fiscal year beginning on July 1. Prior to putting numbers to each budget, we use several committee meetings to accept the information about revenues, and set some guidelines on each budget for maintenance of the current operations. The hard decisions come from the requests for additional money. It would be an unusual year not to have some unforeseen expense in the way the state needs to provide services. As was noted last week, the winter revenue collections are coming in stronger than was anticipated. That is always a good sign of more employment opportunities. Along with the good news, there are new budget requests with the growth in the state, and systems that have outlived their usefulness. Along with the regular requests, this winter has been exceptionally concerning for many who have toured the washed out roads and collapsed buildings in our communities. I would wonder if the 2 million we put aside for disaster relief will be adequate aid. For a century, there has been exploration in the state for gas and oil. This year the state has requested a new department to help with management of that activity. It is a large budget item to start, however, as the industry continues to grow, the revenues will self-fund the department. For the past three years, our corrections population has been flat, the savings used on public schools. The budget this year will be considerably larger due to the prisons filling again and the additional use of county jails. I don’t know the reason, but do know we will do what is necessary to keep our citizens as safe as possible. The cost of putting a person behind bars runs about $55.00 each day. The cost of helping that same person return to society with probation is about $4.00 each day. Interestingly, many of those parolees provide community service as part of the rehab process by helping with community events, such as fairs or helping with lost child searches. A person cannot be taught to hear. We passed a bill to provide better qualified interpreters for the 13 percent of Idahoans with total hearing loss. 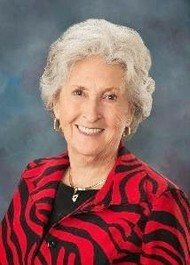 The bill took several years of work to allay the fears of those with hearing loss who use their own family members. That will still be allowed until a qualified person can be available when the situation could be a threat to the health and safety of the individual. And a final note on a yearly budget. We still do one to control the number of wolves in the state. While they no longer need to be monitored, the state has the opportunity to control the numbers. 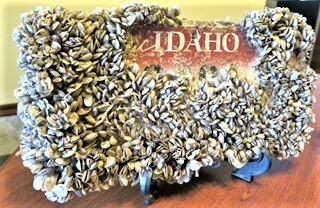 Idaho has 750 in 105 packs. Each year, the state harvests about 300. 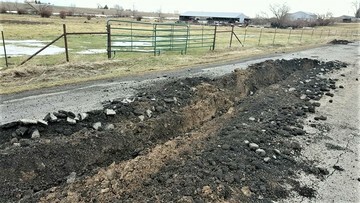 Control is costly, but so is losing a yearly calf crop. It was great to see Laurie Lickley and Andy Prescott serving prime rib in the Rotunda. The Idaho Cattle Association comes to Boise every year to provide a great lunch of beef and beans. Many thanks, it was wonderful. The business of this week included work on legislation concerning transportation funding, tax exemptions for Idaho registered Free Clinics (HB 82) and Volunteers Against Violence. HB 104 gives an exemption to County Fairs to have exhibition style dog races with a limited track length has passed the House and I am waiting for a hearing in the Senate Committee. I was asked by John Pitz the Twin Falls County Fair Manager to look into this because Idaho’s law now states “no dog racing in Idaho”. He would like to book some shows for the fair that have small dog races and if this passes he will be able to book these shows. Rep. Kauffman preparing for his interview on "Idaho Reports". 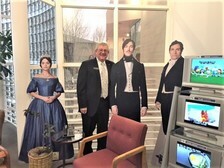 I was on a panel on 'Idaho Reports' talking about the impacts of the wet weather and the flooding in the Magic Valley. In preparing for the panel I contacted County and City officials for their assessment of the damage both now and what they expect in the near future. I also visited with County and Regional disaster specialists to garner their thoughts. The flooding will impact area farms with winter kill of alfalfa and winter grains as well as ruining stored hay and silage that is flooded. I was advised to let everyone know to document as much as possible in the event state or federal disaster money becomes available. There are strict guidelines to be eligible for these funds and documentation is critical. The Highway Districts in the Magic Valley have shared information with me that the current list of road and bridge washouts will be in the millions and that is before the spring breakup starts. Here is the link to the 'Idaho Reports' panel discussion. Next week I am scheduled to present a bill to the Resources Committee dealing with reporting by the Idaho Board of Water Resources. This will require that any change to the State Water Plan will be reported to all Legislators so the process remains transparent. Also next week, I will be presenting a new compromise bill that will extend the sunset on the Strategic Initiative which uses 50% of economic growth over 4% to be split 60% to ITD and 40% to local units of Government for road and bridge repair and maintenance. In the past, local units of government were left out of the increased money. 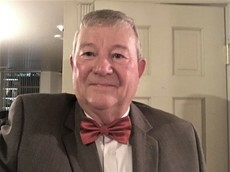 Pictured is Rep. Kauffman participating in bow-tie day on Friday in the Idaho House of Representatives. I had the privilege this week to help some constituents work their way through some rules issues with DEQ. My experience has been that usually the best path forward is to have everyone concerned, come together to communicate their thoughts and concerns. As your Representative, this is one of the most rewarding things I’m involved with. This week I met with Idaho Cattle Assn., Idaho Title Assn., Idaho Soft Drink Assn., Idaho Cattle Women, CSI and other Community Colleges, Idaho Farm Bureau, Idaho Rural Health Assn., Idaho American Foundation for Suicide Prevention, Idaho Beer & Wine Distributors Assn., Jackson Jet Center open house and the Idaho Outfitters & Guides. 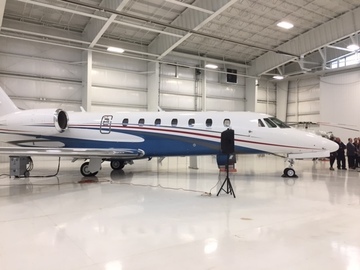 Jackson Jet Center open house.